Mechanization was born with the intention to create an iconic brand of metal that would literally, and perhaps subconsciously, alter the chemical make-up of your bloodstream in a way that allowed metal to flow consistently through your veins. 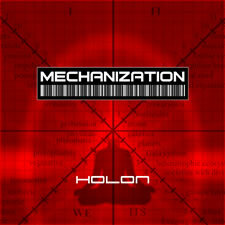 In Mechanization's debut album "Holon", you will find metal so thick that ninjas with swords of lightning couldn't cut through it. But then again who would want to escape the pulse driven madness of thrashers such as "Victory" and "Broken Code"? And what say you of "Metal Skull", with it's pseudo-futuristic clairvoyance and crushing guitars? Let us not forget "Elixir of the Warrior", destined to be a heavy metal anthem of the new postmodern metal age. Mechanization, through their appreciation and respect for their metal forefathers, have harnessed that unique ability to include the guttural purity of only the best offerings in the thrash and death metal genres while simultaneously transcending any limitations weaker bands have previously fallen victim too. There will be no "sadness dripped darkness" found on this album, but rather a determined metal glare into the face of any potential obstacle that dare even stall the unrelenting climb towards metal greatness. One listen to "Holon" will completely alter your belief in the future of metal and send you running towards the center of busy intersections with the compulsion to yell "METAL!!!!" at the top of your lungs!